Nutrition bars can be a convenient and satiating snack that you likely won’t feel guilty eating. However, is the healthy packaging deceptive? How can we be sure that we’re making a healthy choice for a snack, pre- or post-workout fuel or a protein source? 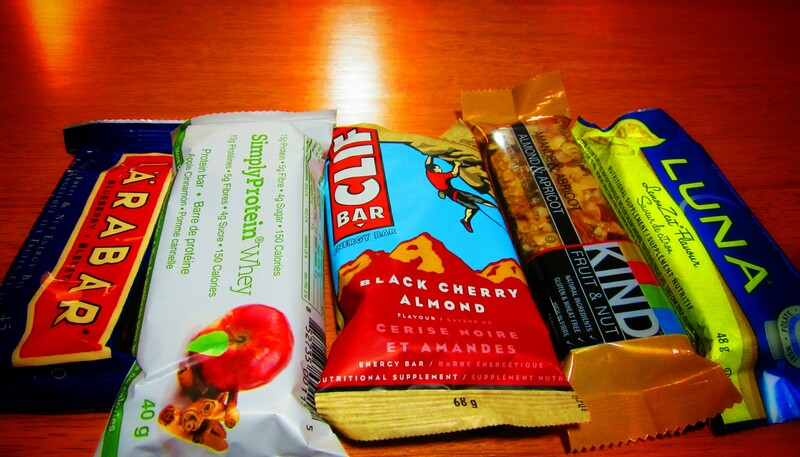 I’ve evaluated 5 common nutrition bars obtained from a health food store – Larabar, Simply Protein, Cliff bar, Luna and Kind bars. I will rank my choices from best to worst. This bar won my approval with it’s minimal number of well-chosen ingredients and fantastic, chewy taste! The flavor I picked up with blueberry, which contained only 6 real ingredients – dates, cashews, dried blueberries, blueberry juice, lemon juice and vanilla! There are better choices in the Larabar line, as this flavor contains more sugar (17 g) and less protein (4 g) then some of the other bars, however I was limited due to my peanut allergy. The peanut butter bar would be a great snack choice – containing only peanut butter, dates and sea salt – at 7 grams of protein. You can also recreate these bars at home with a food processor! Best uses: Between meal snack. Coming in at a close second, the bar also made use of simple and whole ingredients! This bar has a relatively small ingredient list (9 ingredients) of mostly whole foods such as almonds, coconut and apricot. This results in a low amount of sugar (12 g) and carbohydrates (22 g), which is mostly from the dried fruit and honey. A good source of fibre – 5 g (20% DV), however this bar does contain inulin, which is an added fibre isolated from chicory root. Inulin has not been shown to have the same beneficial effects as whole, intact fibre from plant foods and can cause some digestive distress at larger doses. This isn’t a great source of protein – only 3 grams – but there are other KIND bars that contain larger amounts. This bar has its pros and cons. The packaging makes it seem like a great choice with claims “gluten free – easy to digest – low GI – vegetarian – good source of calcium – low sodium”. I’m not all sure that this bar would be easy to digest – the good amount of whey protein in this bar would take about 1.5 -2 hours to digest and the bar also contains inulin, which could cause some digestive distress. Although the ingredient list isn’t horrible (13 ingredients), it seems to be lacking in real foods, with the first ingredient being ‘whey protein crisps’. On the plus side, this bar contains a low amount of sugar (4 g) without containing any artificial sweeteners or sugar alcohols. The amount of protein is impressive – 15 g. If you are a long away (more than 2 hours) from eating a meal after a workout, this bar would be a good choice to use to recover. As always, I would rather you meet your nutrition requirements through real food, so this bar should be used if you’re ‘stuck’ and without real food after a workout. Best uses: Post-workout if next meal is more than 2 hours away and lack of access to real food. This bar contains way too many ingredients – over 50! Also, guess what the first ingredient is? Brown rice syrup…aka SUGAR. How can this be marketed as a nutrition bar if the first ingredient is sugar? No wonder it tastes so good! Although it is a decent source of protein (10 g), I wouldn’t recommend using Clif Bars if you aren’t an endurance athlete. Endurance athletes need 42g of carbohydrates and 22g of sugar to power through a four-hour hike or climb up the Andes Mountains, not an hour-long workout. Best uses: Only for endurance athletes post workout. Best uses: I don’t recommend consuming this bar. I used to live on those bars until I started reading the ingredients. I try not eat anything that has a label now. LOL. It is working.